Enter, business innovation expert David Hamme. 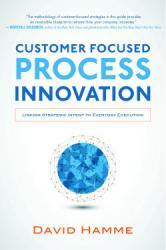 In his book, CUSTOMER FOCUSED PROCESS INNOVATION, Hamme provides the framework to transform organizations into Process Focused Enterprises—ones in which organizational silos, command-and-control management, guesswork, and information inadequacies cease to exist. With more than 20 years of hands-on experience, Hamme’s holistic approach uses process improvement as the language of change. When these concepts are employed in an organization, it becomes possible to systematize innovation by defining operational capabilities in process terms and then specifically adjusting them to produce even greater value in the future. CUSTOMER FOCUSED PROCESS INNOVATION provides everything you need to revamp your processes to innovate, grow, and outpace the competition.